This month, CRN announced their 2017 Products of the Year, with the judging being done by those who work directly with the offerings to solve customers’ problems – the IT channel. At Dell EMC we are always first and foremost focused on the customer, which is why we are especially excited to share that Dell EMC’s newest flagship All-Flash enterprise storage array, the VMAX 950F, is the winner in Enterprise Storage for customer demand. Dell EMC has set the industry’s benchmark for enterprise storage for years and continued this tradition with the release of the VMAX 950F earlier this year, which delivers up to 4x faster performance than the nearest competitor1. This All-Flash array offers up to 4 PB of effective capacity, up to 6.7M IOPS – 68% faster than the previous generation, 150 GB/s of sustained bandwidth2 and response times of 350 microseconds for OLTP databases – 30% better than the previous generation3. It is the ultimate platform to consolidate with confidence – ideal for mixed workloads, it supports mixing mainframe and open systems and offers a 25% smaller footprint than its predecessor. Plus, customers gain greater levels of security, reliability and data protection with the latest version of the HYPERMAX operating system. It is no wonder that customers are demanding VMAX 950F for their enterprise storage. 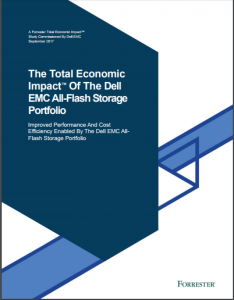 A recent Total Economic Impact study done by Forrester found that the customers interviewed using Dell EMC All-Flash storage experienced key benefits such as increased IT productivity, increased end user productivity, storage hardware and management savings, and a reduction in power and cooling costs resulting in $4.2M of benefits and an ROI of 126% over a three year period4. Home Furnishings retailer RC Wiley chose VMAX All Flash for its entire virtualized VMware environment as well as for its business-critical database because of its six-nines availability and proven track record. “We have a high amount of confidence in the VMAX line of arrays…They’re absolutely rock solid” said Richard Sheridan, IT Manager at RC Wiley. Plus, the VMAX 950F is now part of Dell EMC’s Future-Proof Storage Loyalty Program providing customers additional peace of mind through investment protection with no hidden costs. The Future-Proof Storage Loyalty Program for VMAX consists of the following benefits: 3 Year Satisfaction Guarantee, 4:1 All Flash Storage Efficiency Guarantee, Never Worry Data Migrations, Hardware Investment Protection, All-Inclusive Software and Clear Price Maintenance. Just another reason why VMAX All Flash gives customers the best value for their investment. At Dell EMC, our customers are our highest priority and it’s a great testament that our channel partners have chosen VMAX 950F as the leader in customer demand for enterprise storage. 1March 2017 Dell EMC internal testing compared to competitive array for OLTP with compression and encryption. 2 Based on Dell EMC internal testing compared to VMAX 850F, March 2017. Actual performance may vary. 3 Based on Dell EMC internal testing compared to VMAX 850F, March 2017. Actual performance may vary.